A few weeks ago I was asked what being in the middle meant, and I replied, ‘mundane.’ If you’re in the middle you’re either winning nor losing. The middle is neither success or failure. Neither happy or sad. Being in the middle is nothing, right? I went to a one to one Pilates class this week as I’ve been struggling with my core and pain in my left hip that I’m seeing a physiotherapist for. During the hour I learnt more about my personality than my body, although I did also find out that, unsurprisingly after three children, I don’t have much of an actual strong or stable core. My instructor said she could clearly see that I don’t do things by halves. She asked me if I’m an all or nothing kind of girl and I didn’t realise until I had to answer that question that I undoubtedly am. First, she asked me to move my knee in and out as I was lying on my back, and instead of taking it slowly I moved my knee far too much and far too fast. Again, I didn’t wait in the middle to analyse stuff and see how I was doing and what I was feeling. The move was completed with gusto and efficiency. In. out. Done. And when I got to thinking I realised that this pretty much sums up how I live my life. I go from zero to immediate fight or flight behaviour. I am in a constant state of flux, never stopping in the middle to just, dare I say it, ‘be.’ And it’s the same with my writing, I love the early creative bursts where the story is unfolding and I’m discovering new things about my characters and their motivations. And then when it’s done I want it published and I want it published now. I want it to be good enough already. I don’t mind admitting that I struggle with that middle part, the editing, the slow and steady unpicking of what’s going on, the close observations and discoveries. I’m too impatient. The end goal, the success, is always what I’m chasing. I’m not sure why the middle part of everything fills me with such dread. It’s not that scary. Editing can be enlightening. It can perfect an almost perfect sentence, or chapter, or story arc. It’s what makes the whole thing so much better. Yet every time I get feedback and know I have to do the inevitable next edit and start another draft I have a couple of days of frustration. I’m annoyed that I’m still not at that desirable end goal. And then I start thinking and mulling the feedback over and something magical happens. Every single time I somehow find a new enthusiasm for my work-in-progress and I have new ideas and I get stuck in. Every single time I say, ‘this is the last draft, if it’s not good enough now I give up,’ but I never do. And why? Because I can’t. Because I’m not at the end yet and like it or not I have to endure the tortuous middle part if I ever want to get there. 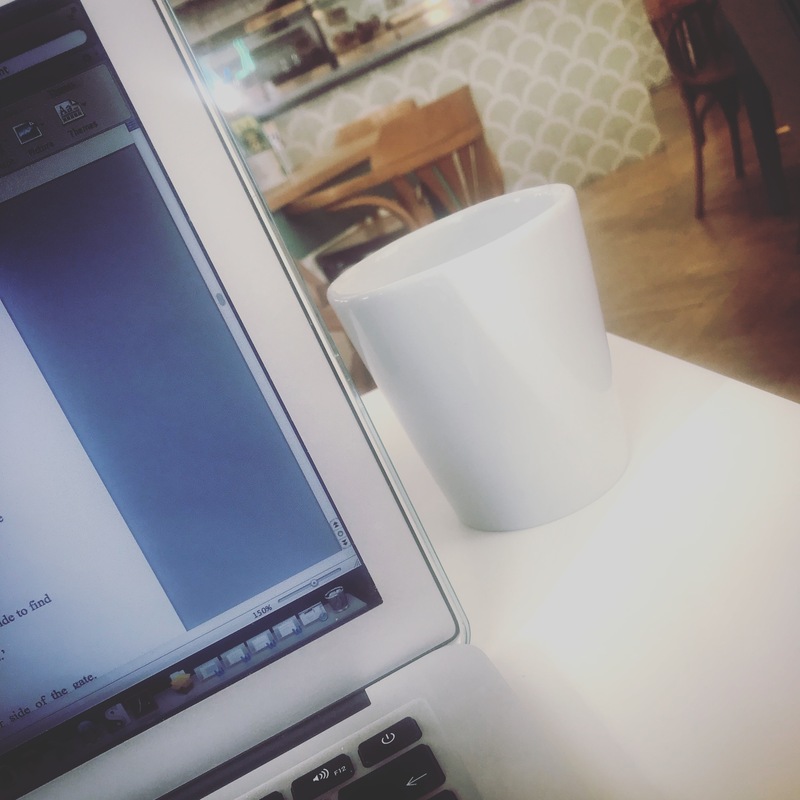 And so I’m sat here somewhere between lunch and dinner, writing this blog post and I’m thinking about what I can do to help me enjoy ‘the middle’ more. Because the middle is important, especially in a novel or short story. The middle is where stuff happens, good and bad. (Think Gone Girl.) It’s where decisions are made, secrets are revealed, characters fall apart, a twist is revealed. It’s where the pace can ramp up or slow down. It’s where the action happens. It’s where you can be pulled away from being all or nothing and where you’re so invested in it you have to see it through. Being a writer isn’t just about writing. In the early days it’s also about learning what kind of writer you are. I met with the lovely Emily Koch recently whilst in the middle of submitting my novel to my editor and waiting for her feedback. She had some wonderful words of wisdom, as she always does, and told me to remember how much I love writing. Because whether I succeed or not, whether I am published or not, whether I win awards or not, I write because I love writing. Because – like so many other writers – I can’t not write. I don’t just write for success and notoriety, I write because it would be impossible for me not to. And maybe this current middle bit where I’m waiting for a response isn’t so bad after all. At least it’s not another rejection, right?